You are currently browsing the tag archive for the ‘ratatouille’ tag. 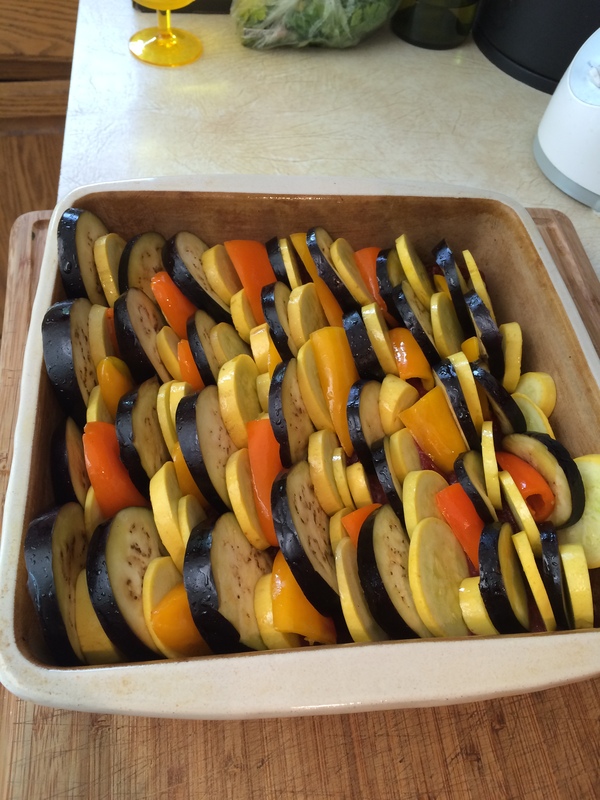 I have prepared and eaten Ratatouille many times. Of course, why not, because I like eggplant . . . a lot. 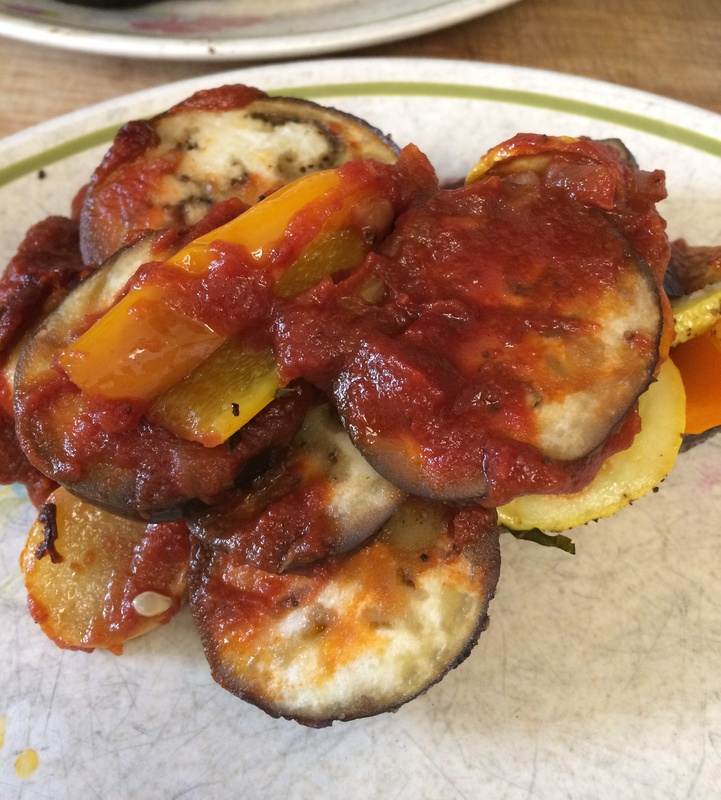 Usually my ratatouille is a delicious, but rather unappetizing-looking, mess. This recipe is something completely different. Not only is it delicious, it’s beautiful! 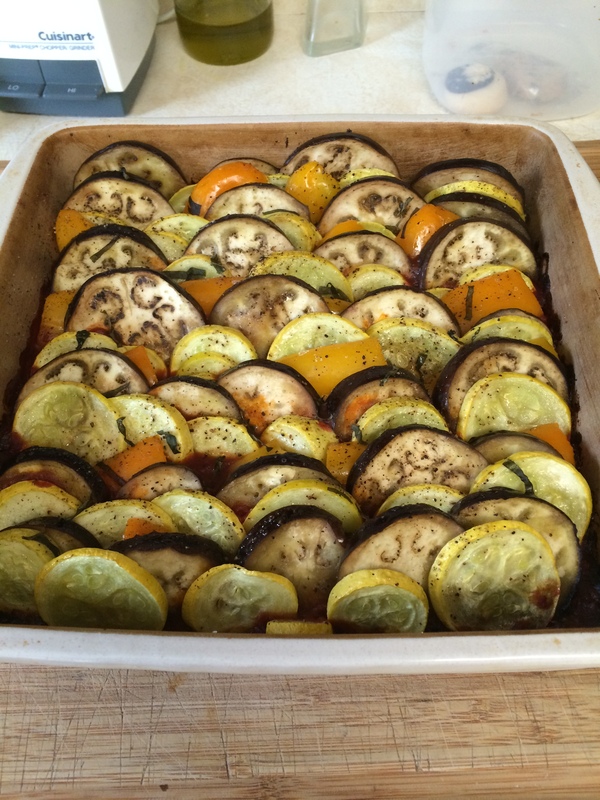 I used the recipe https://realfoodnuts.wordpress.com/2014/01/11/ratatouille-casserole/ at Real Food Nuts, with a few modifications. It was so tasty that I tried it again so I could take pictures and show you how I did it. This is what happens when you don’t have a round casserole dish and you’re married to a wine-maker. Recipes morph. 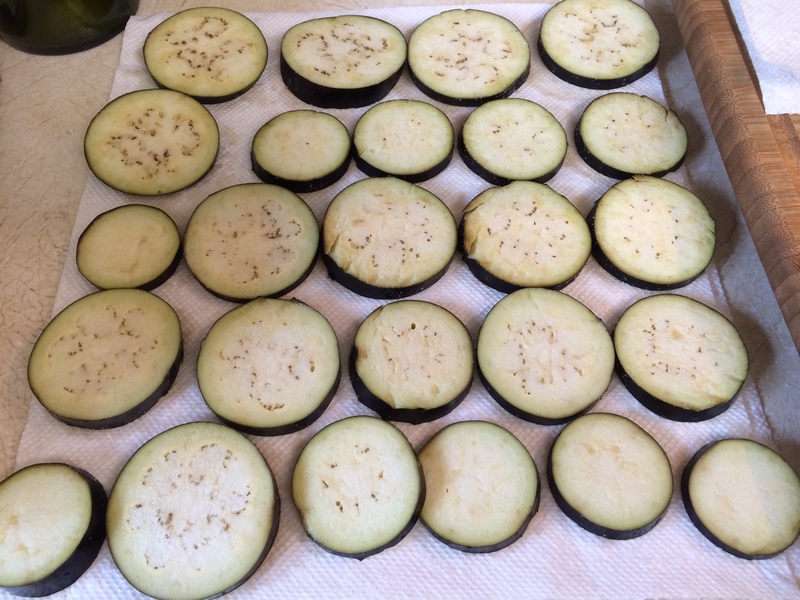 Slice two small eggplants (each one is about 7” long) crosswise into ¼” slices. 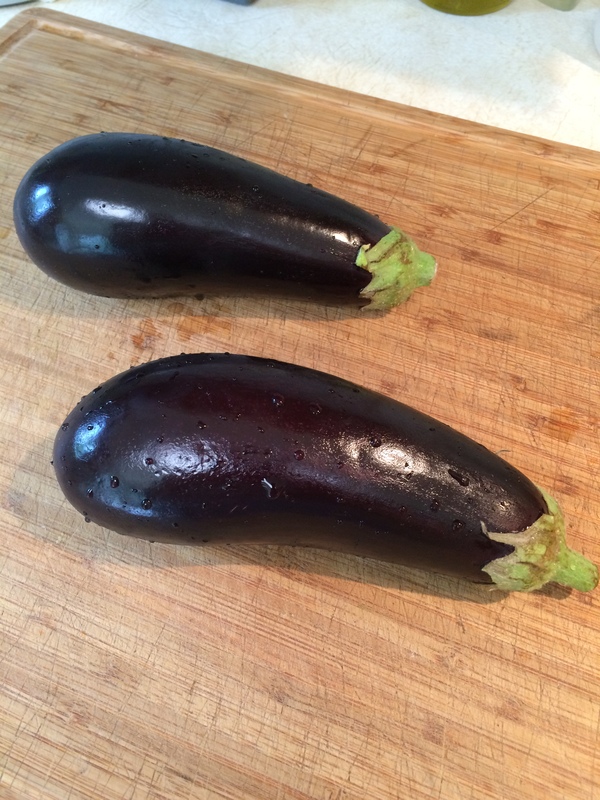 I had bought a package of these small eggplants at Costco the other day, there were five of them in the bag. 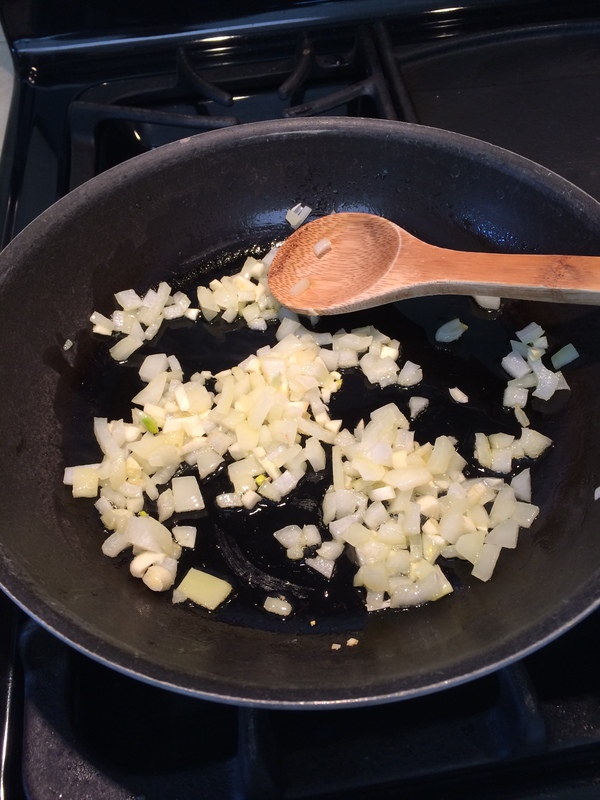 In the meantime, saute onion and garlic in olive oil. When translucent, stir in a 6-oz. can tomato paste, ¾ cup red wine, salt and pepper, and mix thoroughly. Set aside. Rub a 9” square baking dish with olive oil. 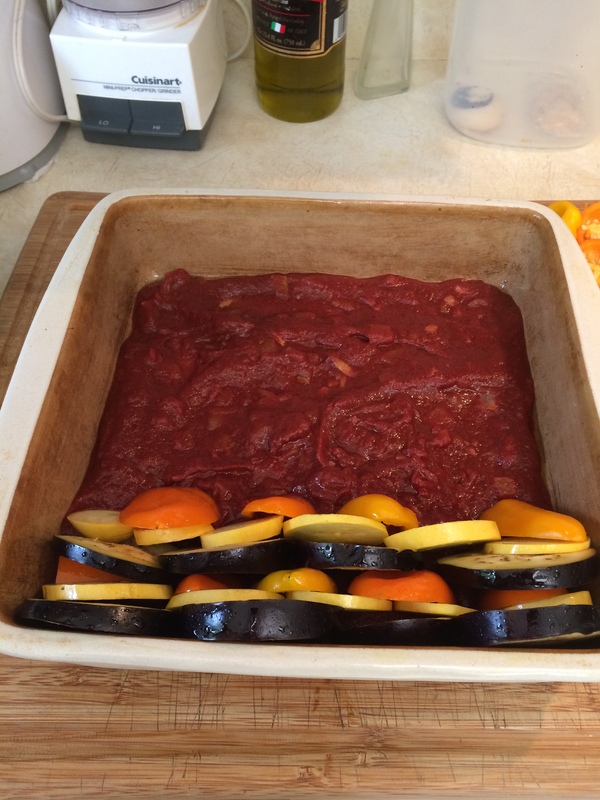 Empty the red sauce into the baking dish and smooth it evenly across the bottom. 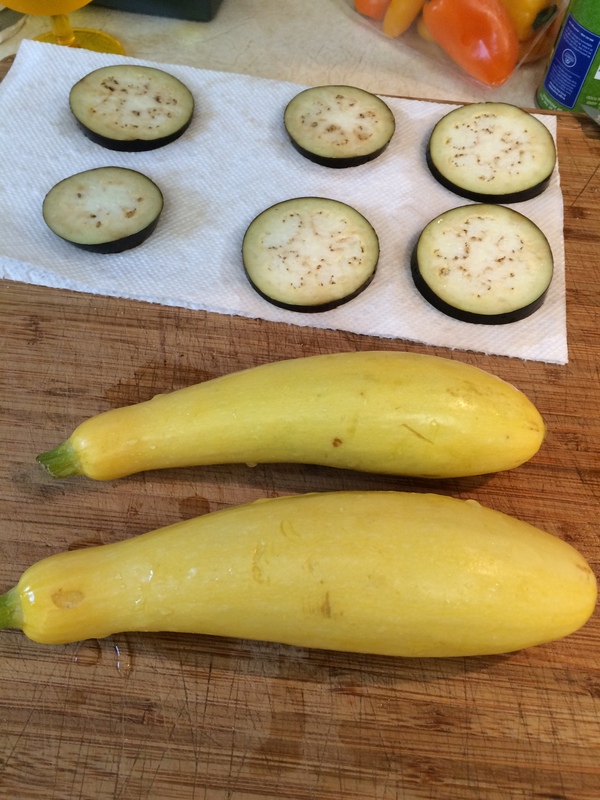 Slice summer squash (yellow obviously is what I used, but zucchini would work just the same) into ¼” slices crosswise. I had a bag of sweet mini-peppers from Costco and I used what was left of those, a dozen should do it. I was a little shy on the peppers, but it turned out fine. I cut the tops off and made sure there weren’t any seeds, then sliced each pepper in half lengthwise. Of course, the usual thing to use would be sliced bell pepper. Use whatever you have. 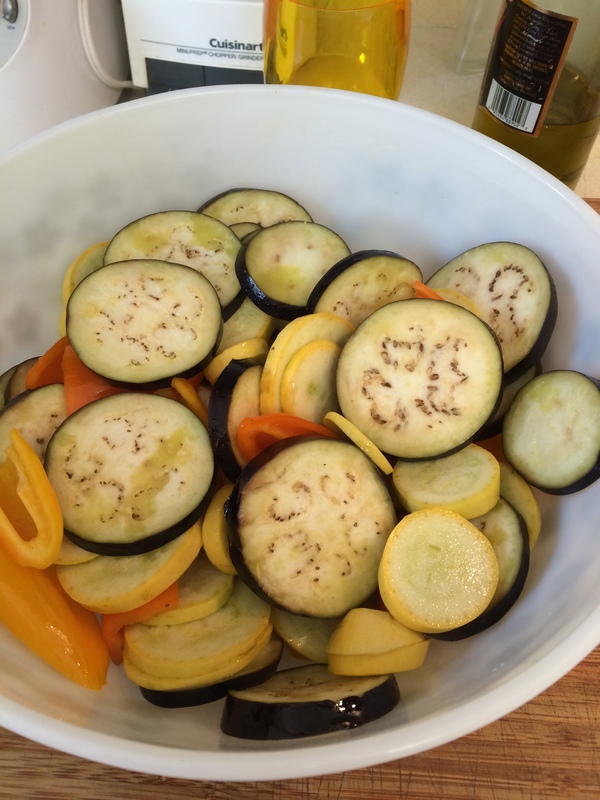 Blot the eggplants with paper towels and put them, with the squash and peppers, into a bowl. 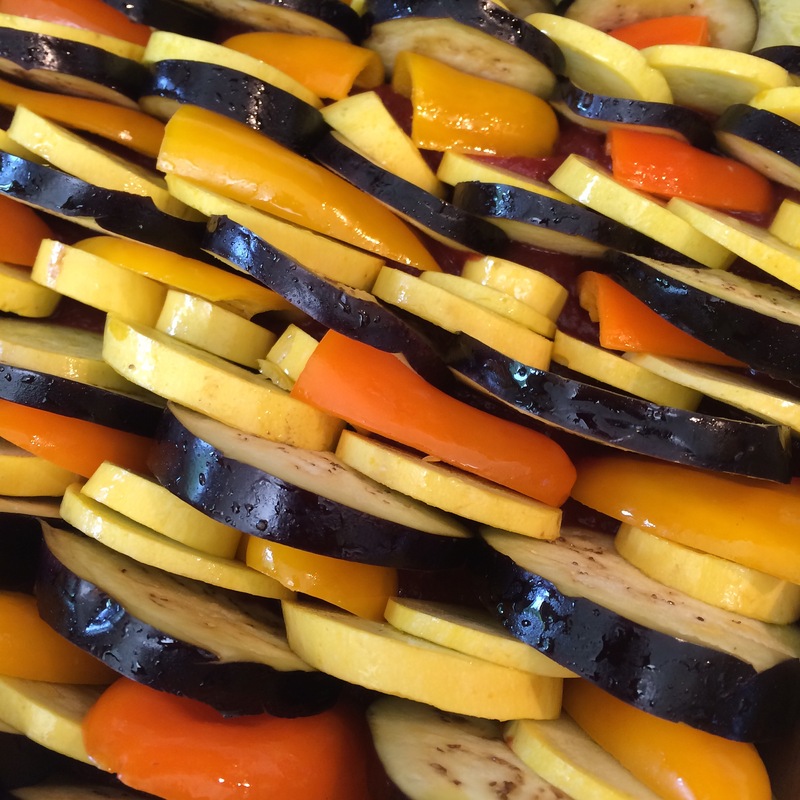 Sprinkle lightly with olive oil and stir around with your hands so that all the vegis are coated. 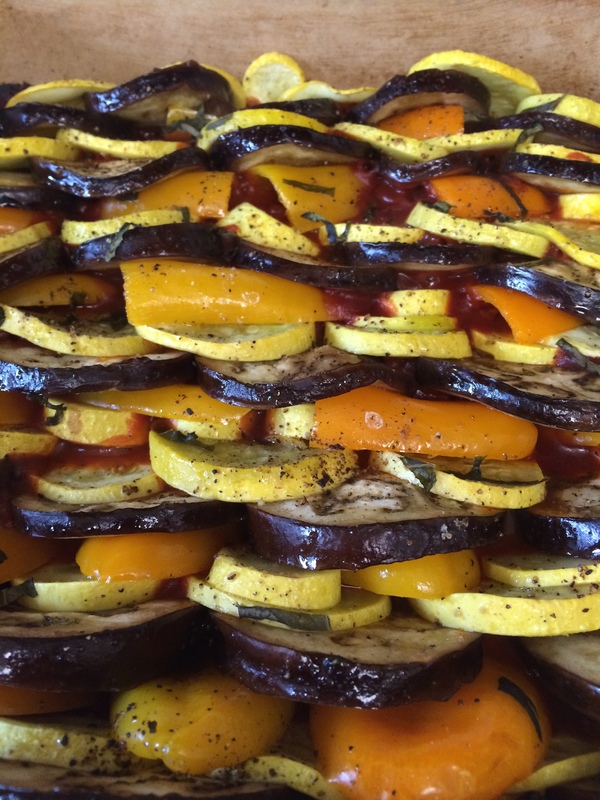 Alternate rows of vegetables onto the sauce as pictured. I started with the peppers upright, but when I realized I’d be short at the end, I turned the remaining ones sideways. I filled in some of the gaps with the smaller slices of squash. Sprinkle the top with olive oil, salt, pepper, and sliced fresh basil. 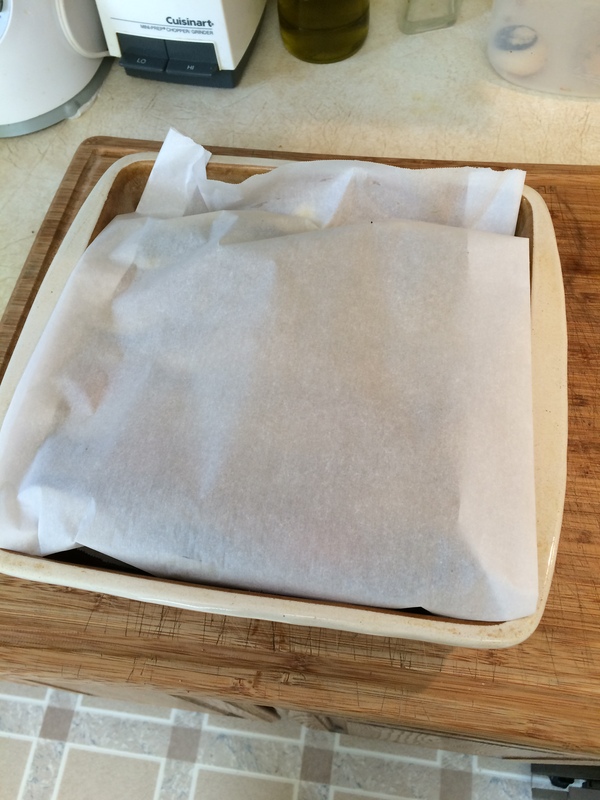 Cover with parchment paper, tucked into the inside, and bake at 375 degrees for 45-50 minutes.